This album was conspicuously absent during the OMD Rock G.P.A. as it was always the most peripheral release of the band. I included all of the self-released live albums by the group but not this one. This was a BBC concert that Edsel bought the rights to and released without any input or approval of the band. Andy McCluskey had no say in the matter, and he had discussed his disapproval with the OMD forum at the time. As it’s a half hour TV concert, it’s more than an EP but less than an album. I was not too troubled leaving this out of the Rock G.P.A. but when it was right there at my fingertips in Amoeba Hollywood, of course I went for it! Once I tested this bad boy with headphones, it was apparent that the CD in this package was in fact, monophonic. This CD was exactly what I had assumed that it was up front – a straight rip of the DVD soundtrack. UK television had scant examples of stereophonic TV programming until the era of MTS stereo broadcasting, relegated to FM simulcasts of “Sight + Sound,” so this was strictly an archival release of small merit for OMD collectors. It’s of note primarily for the appearance of “Enola Gay” in an early incarnation, before they locked down the arrangement and recorded the familiar master. But the band’s BBC sessions disc has this same arrangement in stereo. The CD may be perfunctory, but the DVD is the real meat here, and good quality live concert footage may certainly be enjoyed in mono, though knowing me, it could take decades before I get around to watching this. 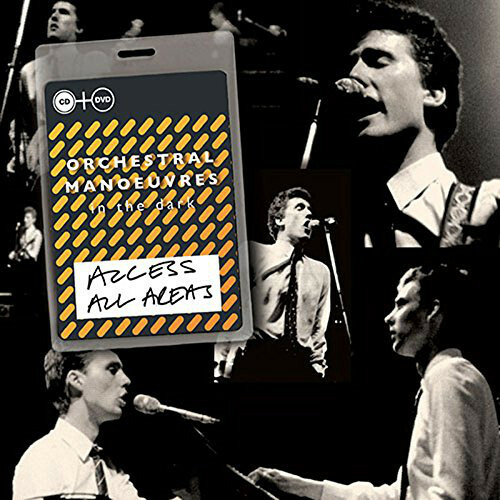 This entry was posted in 30 Days - 30 Albums, Core Collection, DVD, Live Music, Record Review and tagged 1980, 2015, Access All Areas, DVD, OMD. Bookmark the permalink.